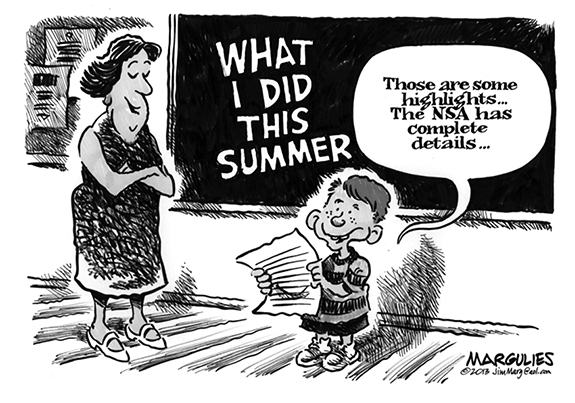 Showing 51 articles from August 28, 2013. LOUISBURG — Investigators have arrested a second suspect in a shooting that sent three people to the hospital. 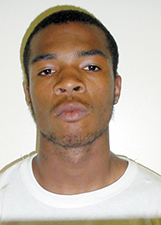 On Aug. 21, Louisburg Police arrested Richard Darnell Williams, 26, charging him with shooting three people at a house party on Bailey’s Creek Drive on Aug. 17. 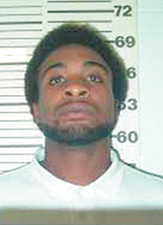 On Aug. 22, Noel Adolphus Matthews, 21, of Youngsville, turned himself in to authorities, aided by his mother. Both were charged with assault with a deadly weapon inflicting serious injury. Traditional calendar students got on school buses, walked to school or got dropped off as the first day of classes for Franklin County Schools began on Monday. 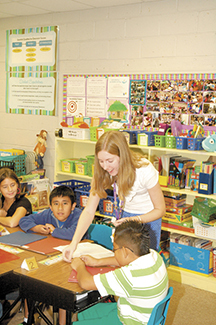 Right, Bunn Elementary School fifth-grade teacher Marjorie Sample hands out some material to her students. Louisburg police arrested two teens on robbery charges, charging one of them with robbing two elderly women at gunpoint. Investigators allege Brandon L. Wiggins and Nakia Neal, both 1 8, broke into a home in the 700 block of Kenmore Avenue on Aug. 19. Franklinton officials have rolled up the red carpet for these birds — and authorized a “death sentence” for a few of the unwelcome critters. Read which critters are causing the issue and the town’s unusual response to the problem in a story on page 3a of this edition. It’s ready. The long-awaited and much-discussed “airport road” from U.S. 401 South to the Franklin County airport is finished and a ribbon cutting is planned for 9:30 a.m. Thursday, Sept. 12. The 1.3 mile road was built with a $1.7 million grant from the U.S. Department of Commerce which was used to leverage another $900,000 from the NC Department Transportation. FRANKLINTON — Commissioners adopted an ordinance to help prevent sewer blockages, but the document does not yet include financial penalties for transgressors. Commissioners began discussing a Fats, Oils and Grease ordinance during its Aug. 20 meeting, expecting to put in place an ordinance that would govern how restaurants keep those damaging materials out of the town’s sewers. The college experience is about so much more than simply getting that piece of paper at graduation — it’s also about learning who you are, and who you want to become. For the students of Louisburg College, our Great Futures Job Shadowing program is a special opportunity for sophomores to get a practical taste of potential careers, thanks to the expertise of our local community hosts. How many more ‘hits’ can our image stand? Sometimes it doesn’t take a crystal ball to know some things just aren’t going to end well. And, as much as I hate to say it, the buzzard-shooting scheme in Franklinton has public relations disaster written all over it. Heaven help us all if the national media — and the late night TV pundits — pick up on that story! According to news reports, Princeville Mayor Priscilla Everette-Oates did her best Richard Nixon impersonation. By the way, I love when people refer to themselves in the third person. That’s never a sign of guilt or someone with an ego problem, is it? It’s time: Tell them the boss is not happy! Need parts for your vehicle? Get them from Strickland Auto Supply. Their business provides a paycheck for someone working here in Franklin County. We live in a country with a sharp partisan divide. Franklin County and North Carolina are certainly no exceptions. When you take a political stand you expect criticism from the other side. When you get blasted by your own side, it is time to re-evaluate your actions. A veritable tsunami of nostalgic frustration washed over me on Thursday, 8/22, when I came across Franklin Times publisher Gary Cunard’s column, as well as that of contributing columnist Steve Trubilla (Semper Fi, Steve). BOYDTON, VA - Harriett Pittard Beales, 100, of Boydton, VA, died Wednesday, Aug. 28, 2013, the widow of Walter R. Beales Jr., and organist at Boydton United Methodist Church for over 60 years. She is the mother of Randolph A. Beales, former Attorney General of Virginia and current Judge of Virginia Court of Appeals. LOUISBURG – Lawrence Elwood Dorsey, 84, of Louisburg, died Monday afternoon. Elwood was a son of the late Beecher T. and Emily Honeycutt Dorsey. He was preceded in death by his infant daughter, Beatrice Yvonne Dorsey; infant son, Beecher Gary Dorsey; sisters, Vera Tharrington and Barbara Layton; brother, Talmadge Dorsey. AROUND END. Louisburg High School back Tyree Thorne (right) turns the corner and heads upfield during last Friday’s home football victory against North Johnston. The Warriors will host Franklinton this Friday night at Patterson Field. LOUISBURG -- Even after building what looked to be an insurmountable halftime lead, the Louisburg Warriors were still destined to encounter their first bit of adversity last Friday night. Louisburg saw a huge cushion against North Johnston dissipate quickly, but the Warriors would respond with a strong finish to wrap up a 50-16 conquest over the Panthers at Patterson Field. 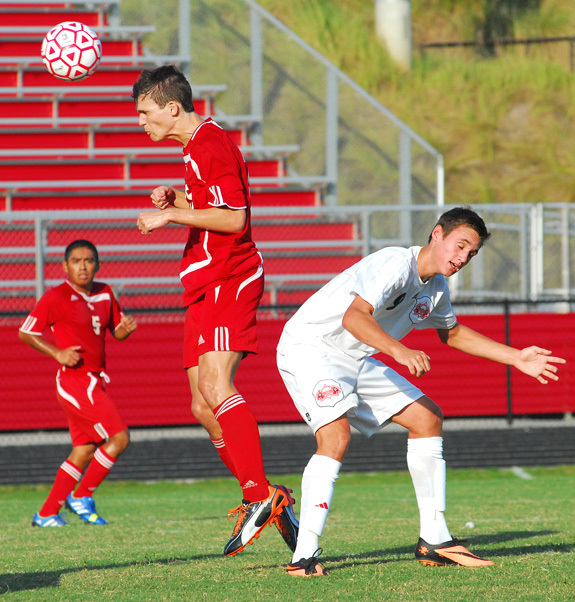 FRANKLINTON -- Nobody can accuse Franklinton of easing its way into the 2013 boys soccer season. FHS head coach Isaac Welker isn’t necessarily happy with his club’s 1-2 start, but the level of the Red Rams’ competition needs to be considered during any assessment. The Red Rams had no problem with Northern Vance, winning by a 6-0 margin last week behind two goals apiece from Connor Chapman and Ivan Rebollar. CALDWELL IN THE CLUTCH. 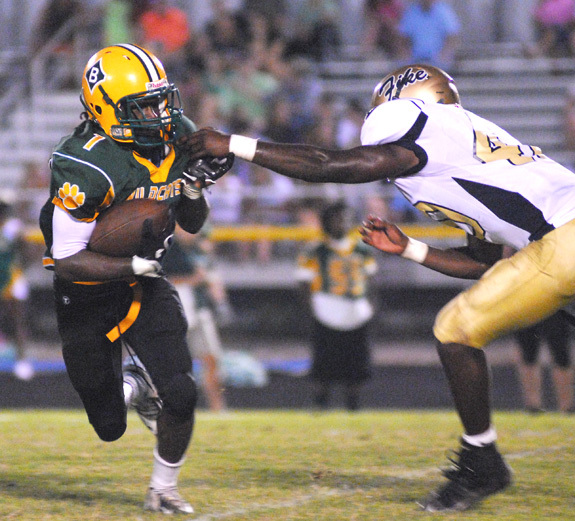 Bunn’s Davante Caldwell (left) tries to escape a Fike defender during last Friday night’s non-conference football matchup. BUNN -- After taking over a young team and making a 180-degree philosophical change on offense, Bunn coach David Howle warned that their could be some ups and downs during his return campaign to the field after a four-year absence. All of those plot twists were evident in the first game alone during the Wildcats’ season opener last Friday at home against Wilson Fike. I CHALLENGE YOU. 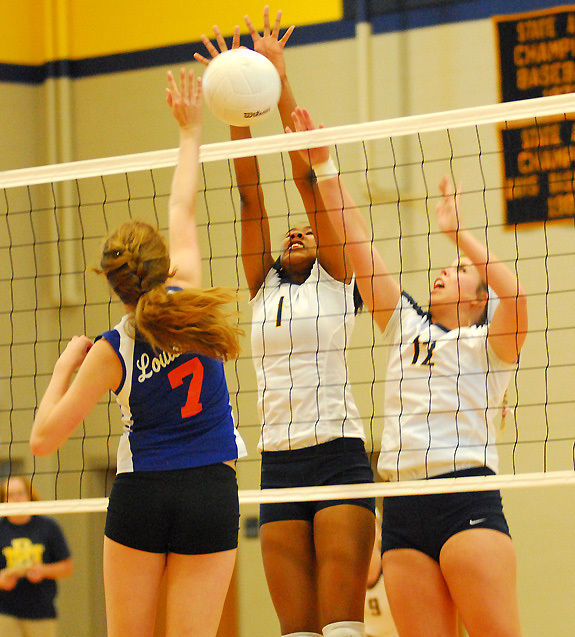 Louisburg’s Marissa Mondin (left) tries to send a tip over two Rocky Mount defenders during last Wednesday’s volleyball event. ROCKY MOUNT -- A fast start propelled the Louisburg Lady Warriors during a non-league volleyball matchup last Wednesday on the road at Rocky Mount High School. Louisburg might be a Class 1-A program, but the Lady Warriors have a rich volleyball history, and they added to that lore with a 25-8, 25-8, 22-25, 25-23 victory over the Class 3-A Lady Gryphons at the RMHS Gymnasium. 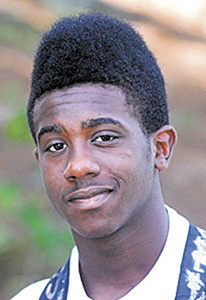 Franklinton at Northern Vance 7:30 p.m.
Bunn at Southern Nash 7:30 p.m.
Rocky Mount Prep at Louisburg 7:30 p.m.
LOUISBURG -- Already blessed with the returning national scoring leader in Jessie Scales, Louisburg College women’s soccer coach Andy Stokes has added another important component to his burgeoning offensive empire. One of Stokes’ top off-season recruits is Sam Rowland, who, like Stokes, hails from England. It hasn’t taken long for Rowland to make an impact for the Lady Hurricanes. 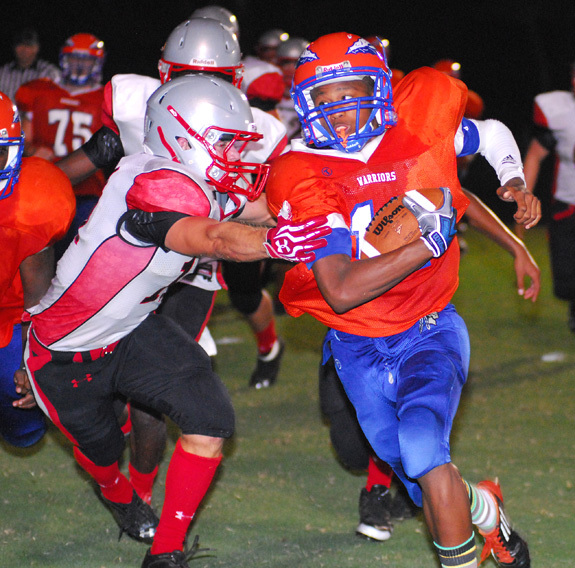 FRANKLINTON -- It took almost the entire first half, but Franklinton’s high-powered offense eventually cranked up in impressive fashion during last Friday’s regular season opener against Goldsboro. The Red Rams didn’t find the end zone until the 1:17 mark of the second stanza. But after that, Franklinton’s complete offensive arsenal was on display en route to securing a 29-20 decision over the Cougars at the FHS Football Field. FRANKLINTON -- The Franklin County Royal Knights Youth Basketball Organization will host a Friends and Family Day this Sunday at the Franklinton Recreation Park. The event will run from 11 a.m.-7 p.m. and is free of charge. Everyone is invited to attend. There will be games, food and live entertainment. DAVIS GETS THE JOB DONE. Franklinton’s Gabriella Davis sends a kill over the Wake Forest defense during last Thursday’s home volleyball event at the FHS Gymnasium. 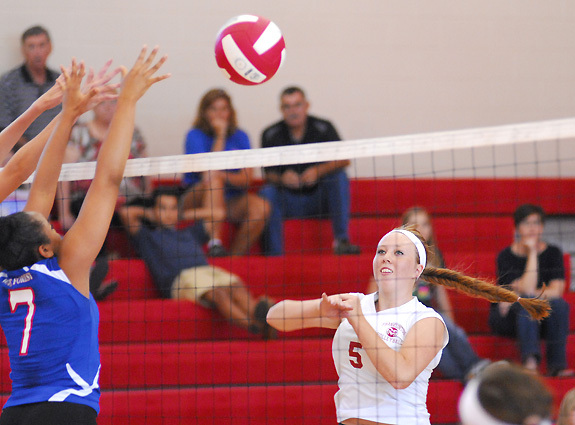 FRANKLINTON -- After a blip to open the season, the Franklinton Lady Rams returned to recent form with a pair of convincing volleyball conquests. FHS’ campaign began last Tuesday with a contest against Corinth Holders in a rematch of last year’s Northern Carolina Conference Tournament Championship. ZEBULON -- The Salem Red Sox scored twice in the top of the 12th to earn the three-game sweep of the Carolina Mudcats on Monday night at Five County Stadium in a Class A Carolina League baseball matchup. The Red Sox (37-26, 70-63) won 6-4 and shrunk their magic number to two games. The Mudcats (31-32, 53-79) committed four errors that led to four unearned runs and fell under .500 in the second half for the first time since July 20. 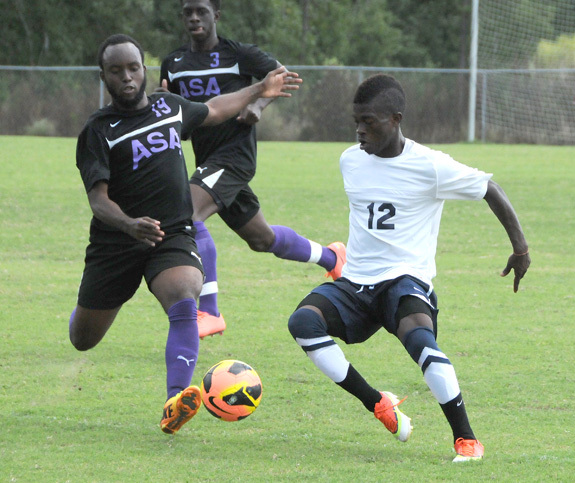 College fall athletic season officially kicked off last Saturday afternoon with a home soccer match as the #2 LC men knocked of ASA College, 1-0, at Ronald L. May Field. The two teams played to a scoreless first half despite a couple solid chances for the Hurricanes in the opening frame’s final minutes. LOUISBURG -- Louisburg’s Lady Warriors came through with a huge tennis victory last Friday, defeating Roanoke Rapids by a 6-3 margin. LHS, coached by Johnathan Waugh, claimed four singles and two doubles conquests against its former Northern Carolina Conference rival. 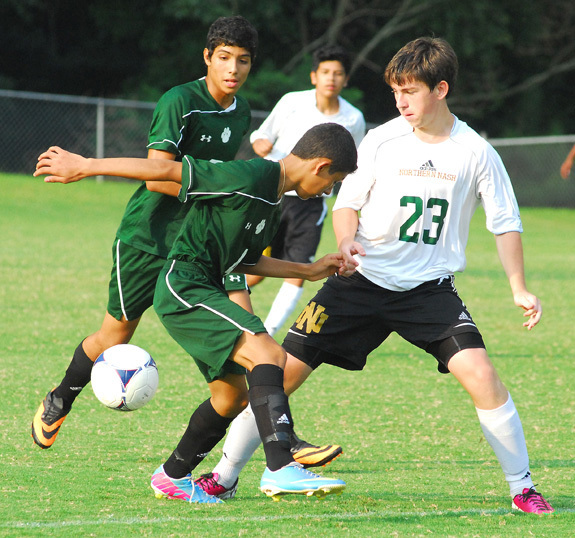 BUNN -- Benj Daniels’ sudden departure as Bunn’s boys soccer coach in July left a void in the Wildcats’ program -- one that Charles Haley was willing to eliminate. As BHS Principal Robin Faulkner was trying to find someone to take the job, Haley offered his services -- and Faulkner was quick to make the hire. 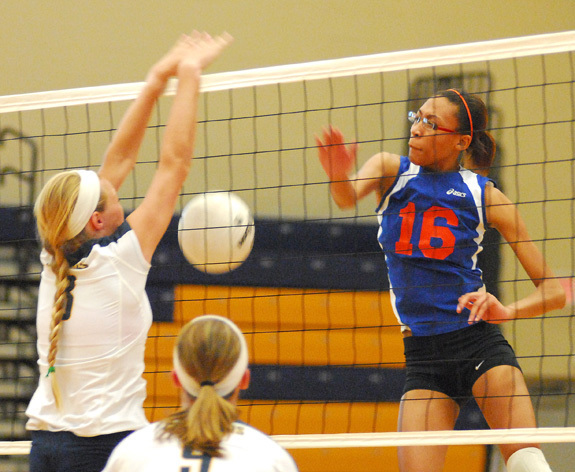 Vanisha Wilshire (right) was Louisburg’s leader in kills, but she couldn’t get this attempt over the net during last Wednesday’s prep volleyball matchup against the Rocky Mount Lady Gryphons. 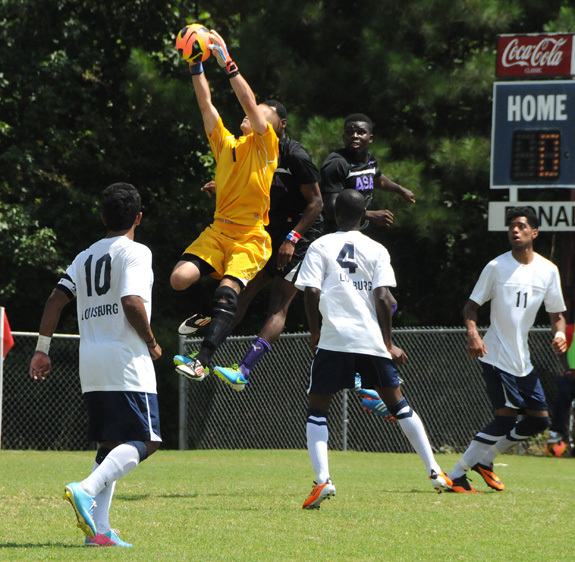 Hassan Kouyateh (right) and the Louisburg College Hurricanes kicked off the 2013 men’s soccer season last Saturday afternoon with a home victory against ASA ouf of New York. Franklinton libero Hannah Rayman made this amazing play to keep a point alive for the Lady Rams during last Thursday’s home volleyball matchup against Wake Forest. 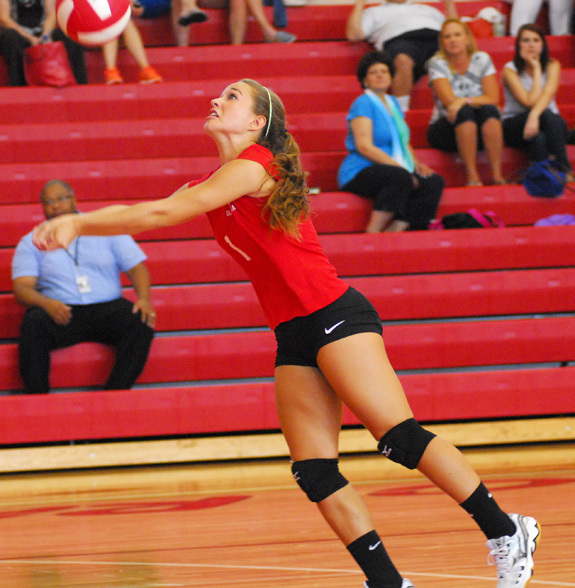 FHS will travel to Bunn today for a crucial Northern Carolina Conference match. What do you call a horned worm on a tomato plant? “Give up”? It’s a Tomato Horn Worm! Tomato hornworms are large, bright green caterpillars that feed on the leaves of tomatoes, as well as tobacco plants. 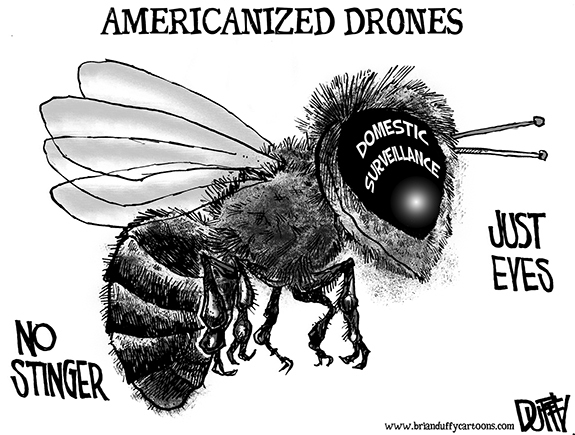 They have a distinct single spine or “horn” on their rear end, but cannot sting. These caterpillars will reach up to four inches in length before maturing into large grey moths. Maylee Moore would like to announce the birth of her brother, Brantley Douglas Moore. 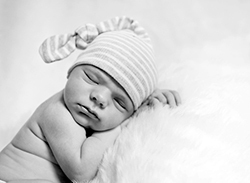 He was born on July 17, 2013 at Rex Hospital in Raleigh. He weighed 8 pounds, 15 ounces and was 21.5 inches long. The proud parents are Dustin and Hope Moore of Louisburg. Maternal grandparents are Ricky and Teresa Brantley of Zebulon. Shanita Monique Warren of Oxford and Jeremiah A’Jason Hayes of Louisburg would like to announce their engagement. The bride-elect is the daughter of the late Helen Thornton Warren and the late Willie Fred Warren of Oxford. 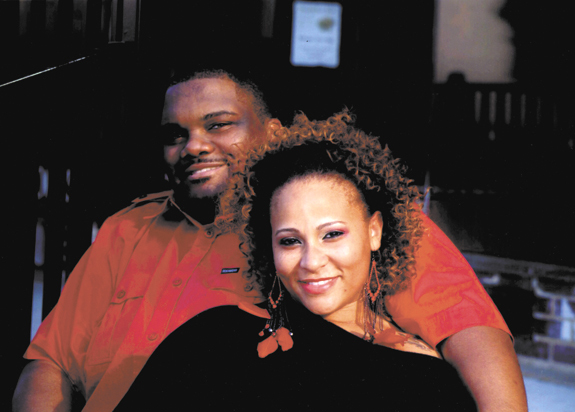 The groom-elect’s parents are Adell Hayes of Zebulon and Carl Williams of Henderson. The wedding will take place on Oct. 5, 2013 at 4 p.m. in Durham. Katherine Faulkner and Philip Junk were married on Aug. 13, 2013 during a 5 p.m. ceremony at Hickory Rock Baptist Church. The officiating minister was Luke Smith. 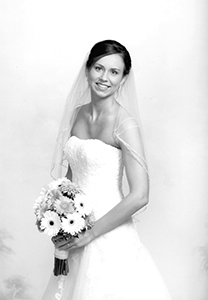 The bride is the daughter of Robin and John Faulkner of Louisburg. The groom’s parents are Robert and Robin Junk of Henderson. ‘Follow your passions:’ Good advice for students? “Guilty as charged,” one mom said at a local manufacturing seminar recently. She was a county official who knew there were terrific manufacturing plants in the area. She was very well aware of the state of the art technologies that went into production. Some of the plants conducted business worldwide and shipped products to places like France, Germany, and China - allowing employees to travel internationally. Four 4-H’ers from Franklin County will be headed to Louisville, KY, in November to represent North Carolina at the 4-H Avian Bowl. These four youth competed in the first ever NC 4-H Avian Bowl in July and brought home the Blue Ribbon. The youth practiced weekly and sometimes twice a week in an effort to be the best and succeed above the other North Carolina 4-H teams. EARNS DOCTORATE. 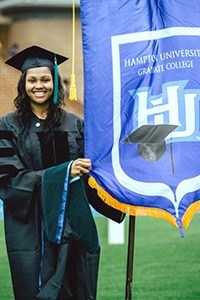 Taleria L. Alston has graduated from Hampton University in Hampton, Va., with a doctorate in physical therapy. She also earned her license in Virginia in July. Dr. Alston is the daughter of Pastor Randolph and First Lady Shirley Alston. She also earned a bachelor of science degree in Biology in May, 2008, from Saint Augustine’s University in Raleigh where she played two years of basketball before focusing on her studies. Vance-Granville Community College, Henderson, has announced that 322 students earned Dean’s List honors for the spring semester that ended in May. To qualify for the Dean’s List, a student had to maintain a 3.5 grade-point average and have no grade lower than “B” while carrying at least 12 semester hours, according to VGCC Vice President of Academic & Student Affairs Dr. Angela Ballentine. LOADING UP. 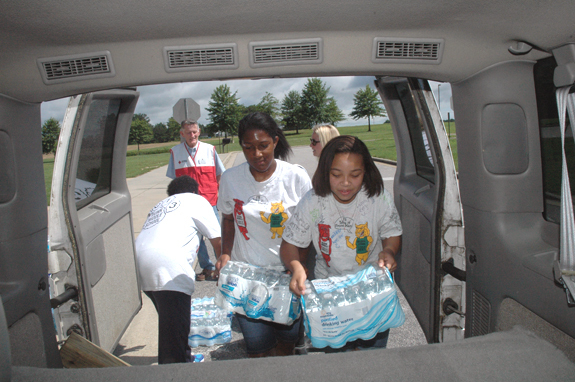 Bunn Middle School students, Joy McCleod, left, and Kayla Durrette load water into the back of an American Red Cross truck. Students at the school donated the water, which was planned to have been used as part of an end-of-year party at the school. Whether you’re a Civil War buff, interested in vintage fabrics or just plain curious, an upcoming program at the N.C. Museum of History should prove interesting. 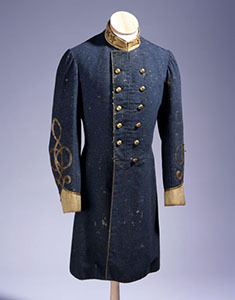 The bloodied coat of Lt. Col. Thomas Ruffin of Johnston County (who apparently also had ties to Franklin County), worn when he was mortally wounded in battle in Virginia Oct. 15, 1863, is a challenge for N.C. Museum of History Conservator Paige Myers. 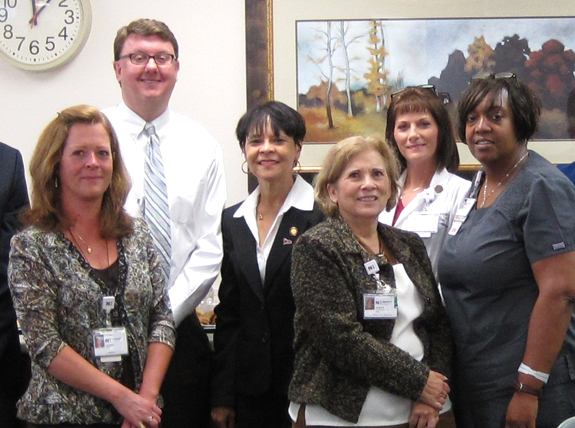 State Rep. Bobbie Richardson, D-Franklin, visited Novant Health Franklin Medical Center recently and her visit prompted a discussion about the impact of placing a cap on the sales and use tax exemption that was discussed in the recent legislative session. Richardson’s visit came on the heels of a decision to cap the tax exemption for not-for-profit businesses at $45 million, a move that does not yet impact Novant. Deputy Ivan Jones went to a residence last week to serve an arrest warrant. He did so. Just not on the intended target. According to his report, Jones had gone out to a residence in the 700 block of Pocomoke Road near Franklinton to serve a warrant on Christopher Price. FRANKLINTON — The town of Franklinton has a new weapon against crowds of buzzards that have overtaken certain areas of the town. 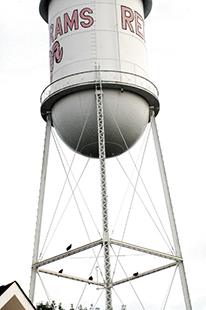 For years, the birds have nested on the town’s water tank, residential structures, back yards, open fields and the area’s Head Start building. YOUNGSVILLE — Law enforcement agents combined last week in an effort to make Franklin County’s roads safer. Officers with the Youngsville and Franklinton police departments, along with Franklin County sheriff’s deputies and officers with DMV’s License and Theft division, set up a DWI checkpoint the evening of Aug. 24 that netted 41 charges. 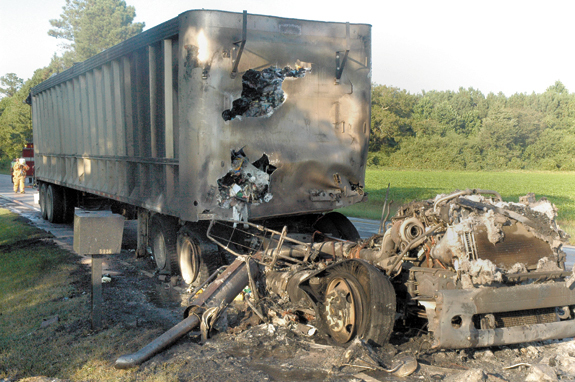 YOUNGSVILLE — A tractor trailer driver escaped injury Monday evening after his rig burst into flames. According to officials, the driver was heading south on U.S. 401 just before Tarboro Road when he noticed some sort of malfunction with his truck, as smoke was beginning to build. When the driver had room to stop and check out the problem, the truck’s cabin had burst into flames. 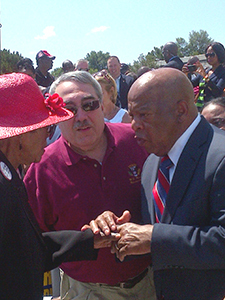 Civil Rights activist Rosanell Eaton, Congressman G.K. Butterfield, center, and national civil rights leader, Congressman John Lewis, had a meeting of the minds this past weekend during celebrations of the 50th Anniversary of the March on Washington. They discussed the present-day need to continue the struggle for equal access to the ballot box in North Carolina, justice, peace and freedom for all people, Eaton reported. The 4th annual Local Food Roast Plate Sale, hosted by the county Cooperative Extension, is Sept. 6. It kicks off the 2013-14 United Way of Franklin County fundraising campaign. It begins at 11 a.m. until sold out.